This is an album that has been difficult to get. But now it is finally beeing rereleased on cd (according to Uncut magazine), it was planned released in the summer of 2011, sadly it didn’t happen. I’m hoping all legal issues have been solved now, and that we finally can get a new and, hopefully, remastered version of this forgotten masterpiece. Update: I read somewhere that august 2013 is the new release month for the re-issue, fingers crossed! Edit: I have done a bit research on different releases, and there appears to have been at least two cd releases before. Well, I cannot find them and have to wait for the much talked about re-release. I have an old vinyl lp that I have ripped to digital format (I have put the record player away on the loft somewhere…), it doesn’t sound as good but it’s what I got at the moment. I really look forward to getting the re-issue. 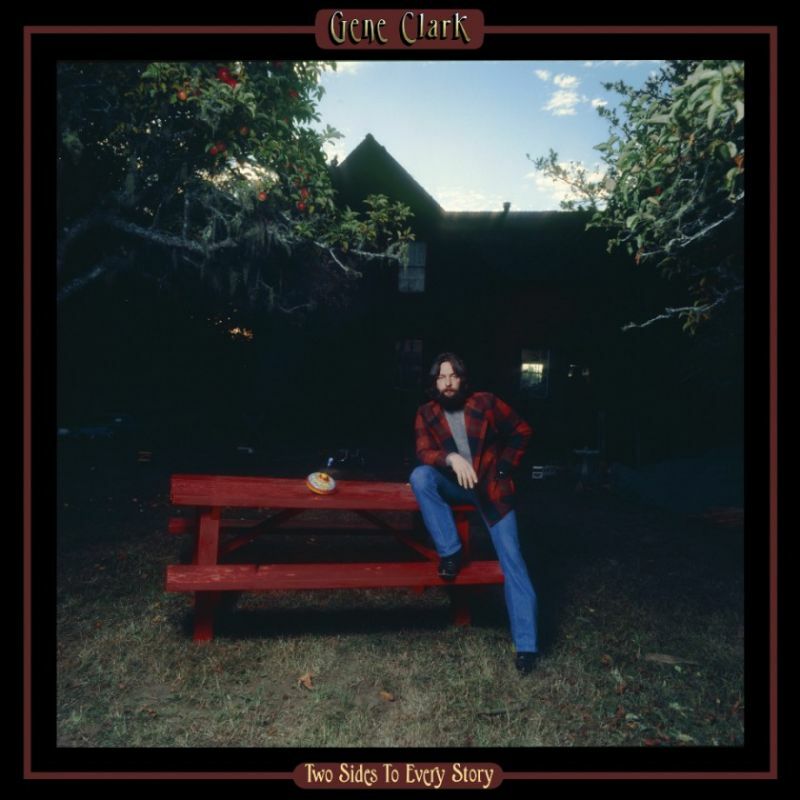 Two Sides was Gene Clark’s last solo album for a major label. Signed to RSO Records shortly after his wildly experimental (and occasionally engaging) 1974 Elektra album, No Other, which is often cited as his masterpiece, Clark and producer Thomas Jefferson Kaye released this. Two Sides is a much lower-key affair, and it succeeds on many more levels than the more heralded No Other. Clark’s explorations into country music are much more at home on this album, as tracks such as “Mary Lou” and “Kansas City Southern” demonstrate. Oddly, one of the highlights of this record is a non-Clark composition, the traditional “In the Pines,” which showcases Clark’s brilliant (and underrated) vocal ability. The following year would see Clark team up with ex-Byrd mates Roger McGuinn and Chris Hillman on the forgettable McGuinn, Clark & Hillman project. Two Sides shows Clark in full command of his awesome gifts. Essential for Gene Clark enthusiasts. Two Sides To Every Story came out in January 1977 (exact date ? ), and for the most part offered more characteristic Gene Clark country-rock. The ballads are the highlights on the records, especially “Give my love to Marie”, “Hear the wind” and the last two songs on the album are outstandig. The Critics then didn’t fare well with the album, they were , as always, extremeley negative towards Gene Clark. This didn’t help with his self esteem, and the terrible review in Rolling Stone must have felt like the last nail in the coffin of his career. He never released an album on a major label after this. To those who admire Gene Clark, Two Sides to Every Story is a heartbreaker—in the worst way. (“Is this the dullest album ever made?” was my original opening sentence. “Probably” would have been the second.) Lugubrious to the point of laughableness, the once-classy Clark creeps through a series of Gibranian ballads that is so Antonioni-slow the songs actually seem to stop. Dead. Like this. Bereft of either interest or ideas, this plodding work can only be described as California-liturgidical. Interlarded among the endlessness are some lame bluegrass (“Home Run King,” “In the Pines”), listless rock & roll (“Marylou”) and the worst train song ever (“Kansas City Southern”). Producer Thomas Jefferson Kaye is a great help, offering an interminable supply of nothing but the moldiest clichés. This is terribly unjust and a review that is not possible to understand when listening to the album. This is an undiscovered treasure, a record that sometimes even surpasses No Other, his masterpiece. Even with the chaos and missteps, this is a record that overcomes its flaws, offering moments of hard-won beauty and open-hearted grandeur from an artist fighting for his career. Featured guest musicians include Emmylou Harris, Byron Berline, Doug Dillard and Al Perkins. Like most of Clark’s albums, it failed to get far on the charts.